QWAC is an established cultural and artistic hub in Toronto, allowing visitors to see art, buys art, make art and taste art. With new partnerships with TD Bank (Presenting sponsor), Steam Whistle and Indie88 Radio, 2016 promises to be an exciting artistic and cultural experience. 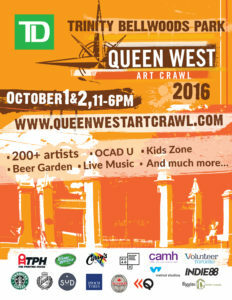 Annually, the hub of QWAC is the Outdoor Art Exhibition in Trinity Bellwoods Park, Saturday and Sunday from 11 am to 6 pm. The art and cultural festival features 200 of Canada’s most innovative established and emerging artists. Visitors can purchase art, take in live music, have a beer at the Steam Whistle beer garden or buy sweet or savoury treats at popular food vendors. QWAC has also partnered with OCAD University to showcase its top graduates in an innovative installation. Finally, there are exciting interactive art activities for both adults and kids, including Jeff Mann’s “Tread On It” t-shirt printing clinic, STAC’D Nuit Blanche exhibit curated by Javid Jah and an interactive dance led by Ecstatic Dance Toronto. In conjunction with QWAC’s in-park festivities, CAMH will be launching Creative on Queen, an art fair showcasing the talents of those who live with mental health and addiction challenges. The Toronto Blues Society will also be hosting live in-garden musical performances at 910 Queen St. W.